Made of top grade microfiber, which is anti-bacterial, and three times more absorbent than cotton. It also features a woven rib pattern that efficiently wicks away grime from clubs and hands. By having two easily distinguishable sides, you will never accidentally wipe your hands on the same side you wipe your clubs. Tell Me More About Uther: Have you noticed that all golf bags look the same? This is what Uther has set out to fix. After working in the golf industry for many years, we noticed that there is no way to truly differentiate or customize golf bags. As every type of golf gear continued to advance, golf towels were stuck in the past. Uther gave these outdated golf towels a much-needed upgrade, by creating the first fashionable and highly functional golf towel line. 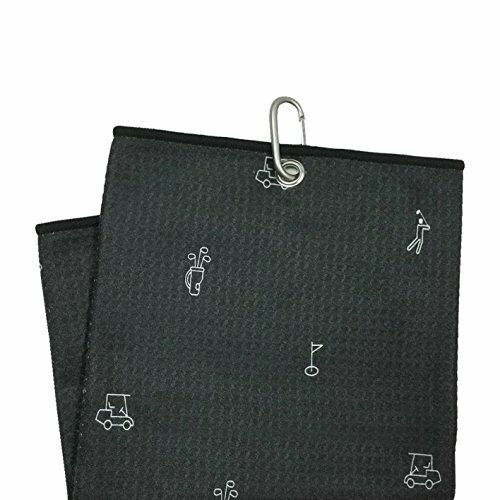 With many unique design options available, every golfer can find a towel that fits their golf bag as if it were custom made. ULTRA ABSORBENT & QUICK DRYING: Uther's unique blend of moisturize wicking, soft microfiber is 3x more absorbent than cotton and 5x more durable. If you have any questions about this product by Uther - supply company, contact us by completing and submitting the form below. If you are looking for a specif part number, please include it with your message.